When I first bought my PS4 last summer, I knew there were a few games I really wanted to check out, but I didn’t want to overload myself (I have the tendency to buy games and never finish them). While NieR Automata was one of those games, I didn’t actually pick it up when I got my PS4 as it wasn’t on the top of my list of games to check out. 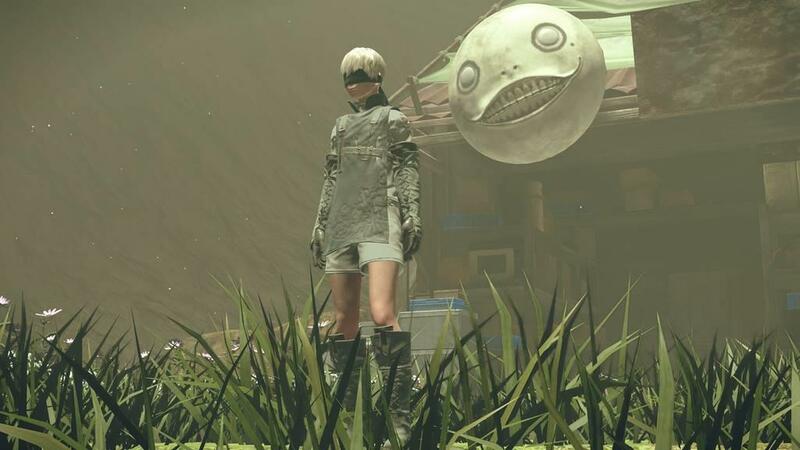 Not too long ago I got the opportunity to check out NieR Automata: Game of the YoRHa Edition and since I hadn’t picked up the original game yet, I jumped at the chance to check it out. Is my excitement justified? Well if the reviews from the original are anything to go by that would be a resounding yes, but let’s dive deeper for a more conclusive answer. 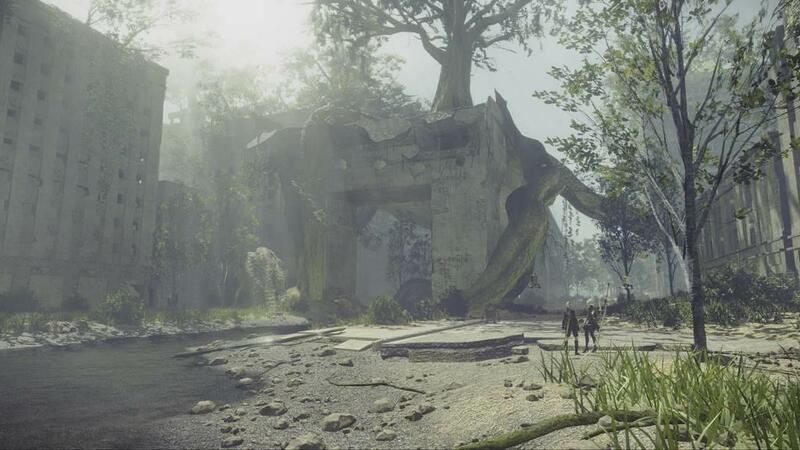 NieR Automata is set far into our future, specifically the year 11945AD, when machine invaders from another world have decimated earth, leaving only the standing remains of a few cities. What’s left of humanity have fled to the moon. 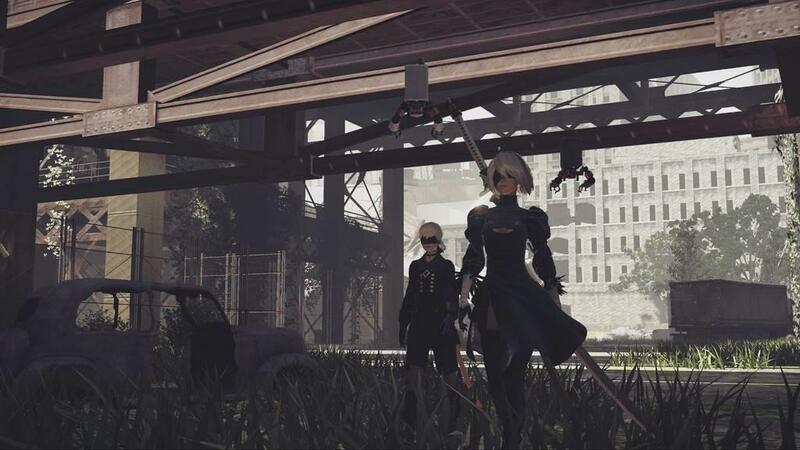 There, the YoRHa project send two androids, 2B and her partner 9S, as well as their two Pods from the Bunker in an attempt to clear out some of the machines attacking so they can explore various areas of the planet. That’s essentially the bulk of the story, at least for now as more opens up as you play further into the game. 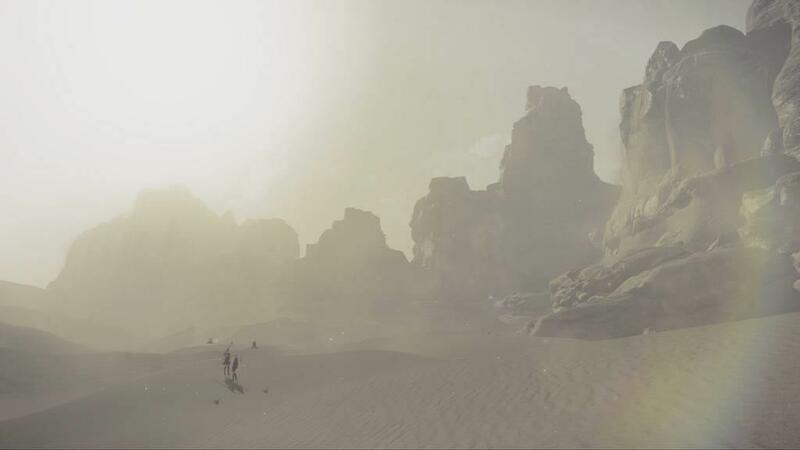 The first area of the game acts as not only the prologue for the game, but a tutorial of sorts where you can get used to several of the game’s mechanics. Sadly not all of them, but I’ll get to that in a bit. 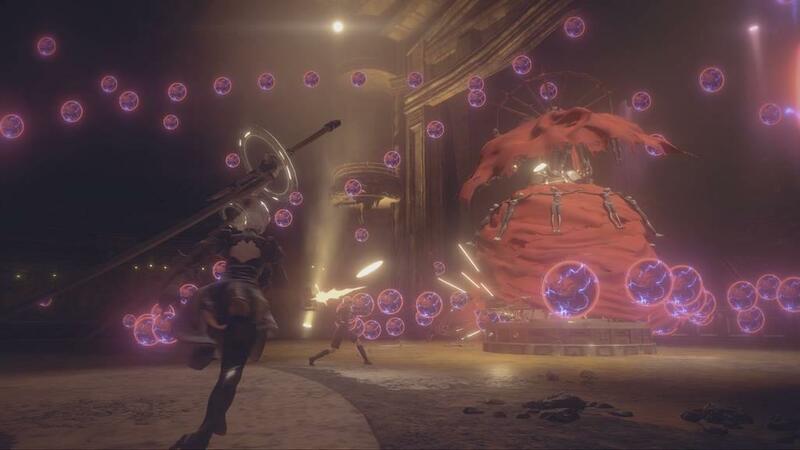 The first thing you’ll notice is that NieR Automata is not just a hack-and-slash RPG, but also has shoot-em-up segments as well where you pilot an armored mech suit similar to games such as Ikaruga. Your mech suit can swing a sword, but for ranged attacks you’ll be using your Pod, the default one you have firing a gatling gun. These attacks carry over to the on-foot sections which make up the bulk of the game, but you can do a lot more with your melee weapons. You can have two weapons equipped at once and depending on which weapons you equip, you can perform certain combos that utilize those weapons. For instance, you can swing a sword a couple of times before spinning around on a spear while kicking any enemy in a small radius. With the Pod you have a primary attack and a secondary function such as a laser beam, though some of those functions have a cooldown period. You can also use L2 to lock onto enemies to make aiming easier, and for your default Pod that’s almost required to have it hit anything. Your best friend is R1, the evade button. While you can run up to enemies and attack relentlessly, you’ll likely get destroyed in the process because enemies can hit you rapidly and before you know it, your health is depleted, if it’s not entirely at that point. You’ll have to employ some strategy in how you attack; get in a couple of hits, then evade out of the way when you see the enemy about to attack you. If you don’t get that down to a science, you’ll have trouble lasting very long. Thankfully once you reach a certain point in the game you’ll have the chance to purchase plug-in chips to enhance your abilities. Plug-in chips include letting you increase your HP or attack power, heal after defeating an enemy, giving you an invulnerable period of time when you get hit from an attack, and more. The higher the rank of these chips, the more effective they are, but they’ll also take up more memory. Thankfully you can purchase memory expansions as well as fuse chips of the same type and rank to increase their capabilities. Strangely the game tells you very little about these chips outside of a few not being available except on the easiest difficulty, so I only found out through just exploring the pause menu. When I was first going through the game I was only a few hours in and decided to look up just how far into the game I was. To my surprise I was already near the half-way point. However, there’s a lot to do besides just the main missions as you can take on side quests. The side quests are a good way to gain items and experience as well as money to buy items, chips, and upgrade your weapons. However, I found that I didn’t really need to upgrade my weapons all that much…well, at first anyway. Much like other RPGs, there’s kind of a NewGame+ mode of sorts which is both awesome, but also irritating at the same time. The upside is that you keep your experience level, items, weapons, money, and so on. You’re also playing as a different character. There are a couple of downsides though. The first is that the second playthrough (called Route B) is essentially the events you just went through (Route A), just from the perspective of 9S, though Route C (the third playthrough) is from another character’s perspective and shows different events. The other issue with how NewGame+ is handled…well, let’s just say that NieR Automata doesn’t really tell you everything you need to know. As stated earlier I had to figure out the program chips on my own. I also discovered that once you hit a certain point in the late game, I don’t believe you can go back and finish any side-quests, buy parts and upgrades, and so on, at least not to my knowledge. The worst part about that is the game doesn’t tell you “okay, as soon you start this mission, you can’t go back and do anything else, so stock up while you can”. Thankfully you can still purchase health items at one point, but I would have liked to fire up my save file and at least finish a few side quests. To be fair though, you will get the chance to do them again in Route B. Another thing you’re not told about (provided I didn’t miss this anywhere) was that occasionally you’ll have to play a hacking mini-game that’s kind of like a mini-shoot-em-up of sorts. It’s simple and easy to get the hang of, but when it first popped up on me during an armored mech fight, I briefly panicked as I tried to figure out what just happened as it kind of came out of nowhere. So since this is the Game of the YoRHa Edition you get all of the DLC. Most of this is just skins and avatars for the PS4, but the meat of the DLC are the Colosseums. At some point you’ll get a message in your inbox that will open up three Colosseums. Each one has you taking on multiple rounds with each round having you deal with multiple enemies. Each successful round and finishing all three Colosseums will let you work towards a new ending that’s not one of the twenty-six from the base game. Oh, and those twenty-six endings? I’d be lying if I said I’ve seen all of them but from what I understand, most of them are just joke “game over” endings, with only five (six if you count the DLC) being real “end-of-the-game” endings. I’ve read that a lot of people soured on the fact that to really experience the full story you had to play through multiple times, and that playing through Route B wasn’t worth it just to see what happens in Route C. Fair enough, though I personally don’t mind that concept. My main annoyance was the constant shifts in camera angles. In the same area (specifically the factory at the start of the game and you’ll come back to it later on) you’d go from a 3D perspective, to 2D, to 2D reeeeeeeeeeeally zoomed out to where it’s hard to see just where you are, let alone what you’re hitting, to a top-down perspective where your sense of height is non-existent. Personally, I loved the armored mech areas and the boss fights with them and I really wish they did more of them, at least with Route A. Granted they didn’t feel too difficulty (grind for a bit and even the final boss is not that bad), but as a fan of shooters such as Ikaruga and the like, this was a welcome surprise for me, especially with one boss fight that took so long I was wondering if it was the final boss. Overall, NieR Automata: Game of the YoRHa edition is an awesome game and one I’m glad I finally got the chance to play. Graphically speaking the game looks pretty good on a PS4 (for the record I have a standard PS4, not the PS4 Pro) and the music is simply amazing to listen to, sounding calm and intense at the right moments. Again, I understand that some people weren’t fond of Route B being basically Route A from 9S’s point of view and you had to do that to ultimately witness the whole story, but I’m usually more about the gameplay itself and with as much fun as I had with the game, I’d have no issues revisiting this down the road to ultimately finish everything. 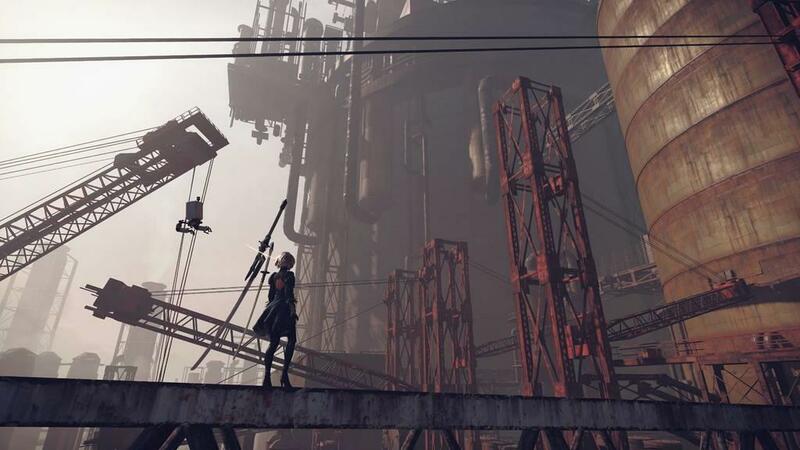 If you’re looking for a good hack-and-slash RPG with some mech-shooters and the occasional awkward camera perspectives thrown in, give NieR Automata a try. Just don’t be too surprised with how short the main story can be on the first run if you basically do nothing else.